Market your brand with A9 envelopes. These envelopes can be used for direct mail marketing campaigns - print bulk envelopes for mass advertising campaigns. These can also be used for social correspondences. Send out important documents to clients and business partners. Print them with your logo or brand name and distribute it to your target market. A9 envelopes are also used for mailing personal letters, invitations, greeting cards and photo cards. 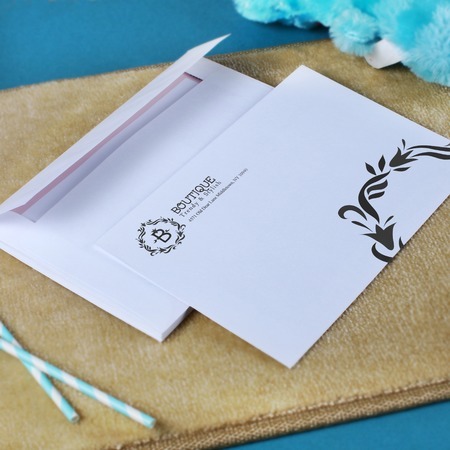 Send out your messages to your loved ones with custom envelopes. Mail and deliver it right at their doorsteps. UPrinting offers envelope printing services. 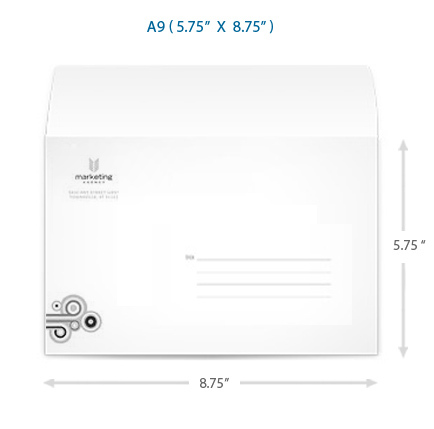 Our A9 envelopes measure 5.75" x 8.75" - big enough to hold a half-folded sheets of paper or handcrafted greeting cards. The envelopes come in white and have gum-sealed square flaps. Choose from black, reflex blue or standard red ink for printing your logo and return address. Order from 250 to 100,000 pieces and have them shipped in 2-3 business days. Contact us at 1-888-888-4211 or chat with one of our customer service representatives available 24/7.